The following is taken from a brochure put out by the Glengarry Pioneer Museum. the difficulties of pioneer life. found on every early farm . spinning wheels, and quilting frame. 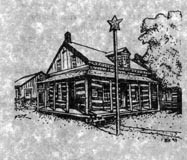 Star Inn, a coach stop during the mid 1800's. believed to be the oldest bar in Eastern Ontario. consists of several log and heritage buildings. Scots who first settled in the area.